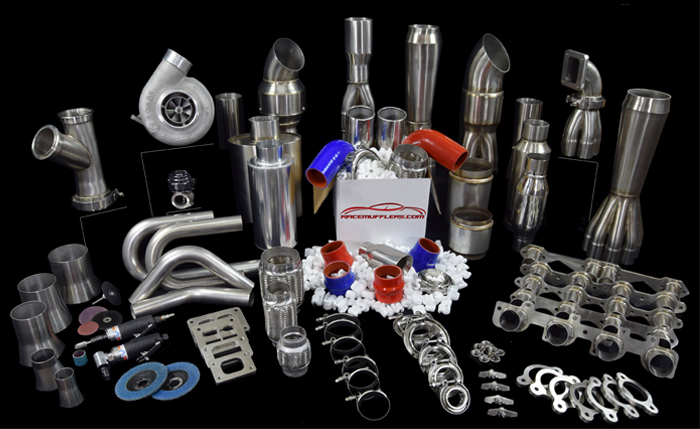 From race mufflers to header fabrication parts, we have a complete line of stainless and mild steel header fabrication supplies. Our race mufflers come in a variety of configurations and materials. We carry the Stainless Headers Manufacturing brand and Vibrant brand of race mufflers. Our header flanges are offered in stainless and mild steel in the bare flange or flanges with stubs welded on. As a direct supplier of formed and slip on merge collectors, we can offer off the shelf units and custom merge collectors. This ability to offer custom merge collectors means that we can fabricate any merge diameter, secondary length of flange option. As example, if you wanted your merge collector to have a V band flange or a T4 turbo flange, no problem. Our in house fabrication department builds custom merge collectors every day. Our stock of stainless mandrel bends is one of the largest in the industry. With 1000s of mandrel bends you can be sure that you will find the right diameter, center line radius and degree of bend you are looking for. To help you finish off your exhaust system, we offer a complete line of V band flanges, stainless flex couplings, oval and round stainless tubing.